isa Thanks for this analysis and the charts. Your chart clearly shows that the June 2010 b/o to stage 2 was a lot neater and more textbook than what is going on now. (I think there was some talk of oil company takeovers back then, unlike so much now.) It does make me wonder if it is better to select the neat breakouts rather than messy ones. Nevertheless, the actual breakout in the second week of Jan 2012 did occur above a rising 30wk wma. Page 118 refers. Premier Oil does look strong, though is inevitably vulnerable to a pause in the crude price rise. I take your point about page 118. However, from my studies of the stages I've come to believe that that approach is only for the most aggressive short term traders (which I know you are from your posts ) as it was borderline whether the range that formed before the January breakout was Stage 1 or Stage 4B as it was below the 30 week WMA. [Bignick Question = Weekly or Daily to determine breakout?] It depends on whether you are using the trader method or the investor method as the Stage 2 breakout point is the same whether you use a daily or a weekly chart. But focusing in on the daily chart after you've identified the stage and breakout level on the weekly chart is probably the best way to go if you are using the trader method. But if you are using the investor method you can stick to the weekly charts imo. I agree a b/o is a b/o whether on wkly, dly, one-hour or one-minute chart, so what should we be looking at? Weinstein does not talk about end of day close price or end of week close price - though obviously those help! - so it is more to do with what time you have to devote to the activity. His discussion of buy stops on pp 65-68 suggest end of day or end of week study is fine. In practice all the conditions come together on one day, so taking the Jan 2012 PMO breakout as an example, on the day of the actual breakout, the second long up candle in the first week, the 30wk wma was probably not rising, and the 30wk wma would not have risen until the long up candle Thursday of the second week. Ideally in this order: 1. you'd have anticipated a rise in the 30wkma to occur the following day and so put a buy stop on Wed night(at e.g. 395p), 2. you'd have bought during Thursday, or 3. you'd have bought during Friday. By Friday PMO would have aroused attention, so who knows what you would have to pay the following Monday. Page 25 says weekly charts are best; I suppose in the 1970s and 1980s only the end of day or end of week charts were available - and cost an arm and a leg. Thanks for finding that lplate. I just listened to it all and took notes and will probably listen to it a few more times to take in what he said properly as is hard to when taking notes. I now have his email address so am going to write to him soon as I'd like to be able to get some old samples of the global trend alert so that I can get more stock examples of the stages and sub-stages as each issue has the entire S&P 500 stocks and their stages. So I think that would be really helpful for us all if he agrees to give me some old issues, and maybe we might be able to get someone from his company to answer some questions on the thread if we are lucky. Attached is the latest US Industry Sector charts for analysis. 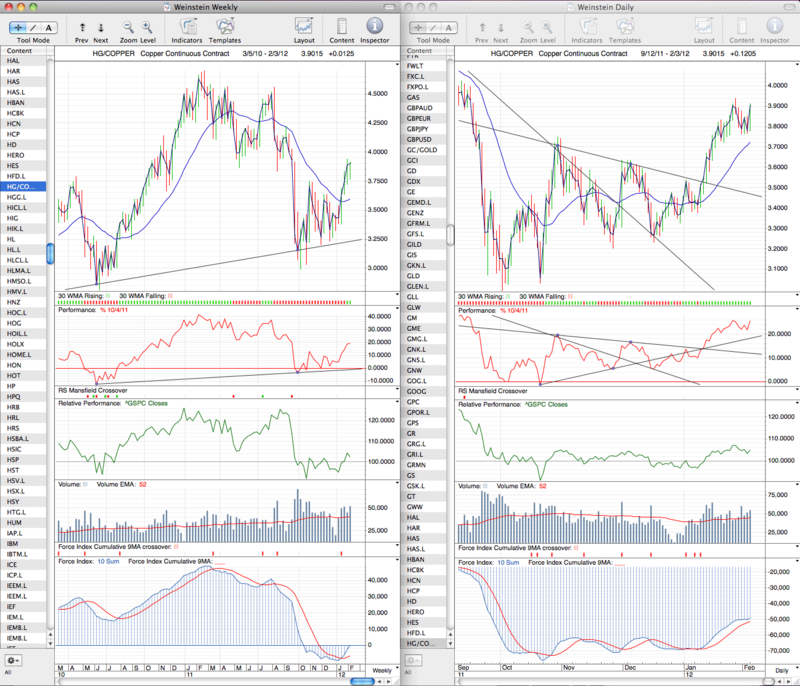 Attached is the updated major charts for analysis. Crude Oil (CL) was the out performer last week with a breakout move up to almost $110. Treasuries were fairly flat again and continue to hover around the 30 week WMA which is flattening out and would likely turn down if the price broke below the recent range for a few weeks. Gold is another interesting chart as it made a continuation short term breakout within it's huge range since last summer, however in the short term it has resistance at 1800 to break through, but to become a longer term buy again it needs to close above last years high around 1925 as Stan mentioned in the interview lplate found. The S&P 500 made an attempt to reach last years high last week and fell just short on Friday of reaching it. However, it did make another higher high and lower low on the weekly chart, as did the Nasdaq 100. So although the short term correction/consolidation seems likely, the price action is yet to confirm it. Stan mentioned in the interview a break of the 1340 level for a short term correction to occur and until then price action is still positive. So I'm watching for either a breakout to a new high or a pullback into the lower 1300's on the S&P 500. Copper (HG) made a nice pivot last week off of the $3.70 support from the October 2011 short covering rally high. It's forming a small Stage 1 range above that support level between $3.70 and $4.00 and I'm looking for a Stage 2 breakout above the $4.00 level to get long again personally. Finally, the Dollar Index (DX) made a move down towards it's trendline support this week and closed very close to it with the daily price making it's lowest close since November 2011. This is an important one to watch this coming week as if it continues lower then the commodities such as Gold and Copper will get a further boost, but if it reverses it could aid the bears desperate for a correction. So a very key week ahead as a lot of the charts are at critical support and resistance levels. Remember to follow the price action and not your opinion, as as Stan said in the interview, discipline is the key element to good trading performance. So only play the price moves that give you the best probabilities for success. The NYSE Advance Decline moving averages continue to show strength and the weekly has broken above last years highs. The 30 week weighted moving average momentum is continuing to make higher highs each week and has shown no signs of weakness yet this year. Prices distance above the 30 week WMA has remaining fairly static throughout February at between 7 - 8% above it. 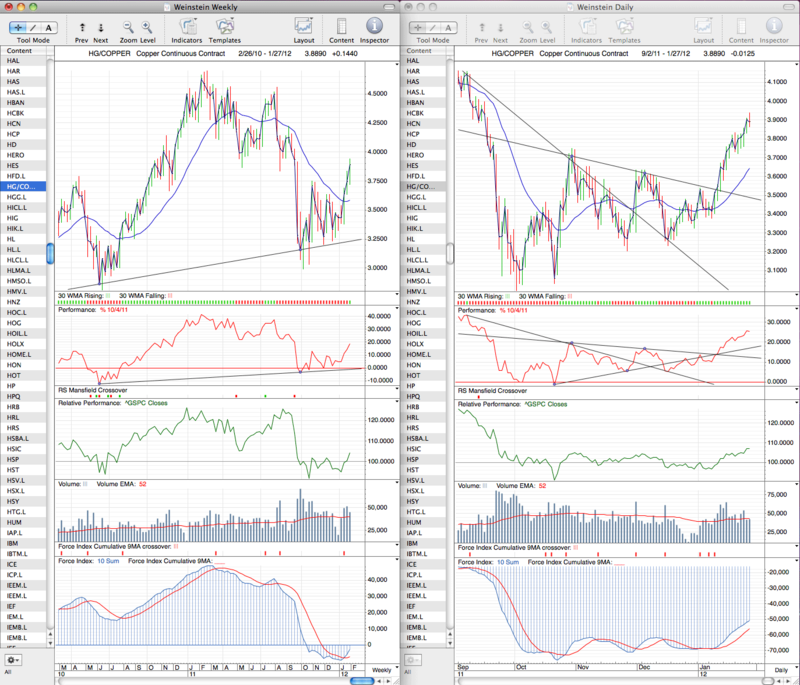 Attached is the latest UK sector charts for analysis. FTSE 350 Sector Electronic & Electrical Equipment continues to be the main out performer and the group has done 26% better than the S&P 500 since the October low.
. . . Copper (HG) made a nice pivot last week off of the $3.70 support from the October 2011 short covering rally high. It's forming a small Stage 1 range above that support level between $3.70 and $4.00 and I'm looking for a Stage 2 breakout above the $4.00 level to get long again personally . . . . Thanks again isa for your hard work in producing all these excellent charts and thoughtful commentary. Again it shows how different people see different breakout points on a chart. On copper my thought is that I should have gone long already, as the breakout into stage 2 is already evident at 3.75 in your weekly charts of 27 Jan 2012 and, even more clearly, 3 Feb 2012. I did used to think the same as you when I first started this thread, but when I started going through the examples from the global trend alert last October I changed my view as the Stage 1A, Stage 1 and Stage 1B examples led me to believe I had been calling the Stage 2 breakout too soon, especially when there was a decent amount of overhead resistance to work through. Have a look through the examples again here: http://www.trade2win.com/boards/technical-analysis/134944-stan-weinsteins-stage-analysis-3.html#post1698054 and see if it changes your mind. It might not, as there are examples that are harder to read and there's some overlap of the sub-stages. Which is why I really want to get some more old samples of the global trend alert from Stan, so I can do more examples and better define the stages. There are a few really good examples of what I mean in the examples posts. Not all of them are great examples, but one that is clearer than most is WPI here: http://www.trade2win.com/boards/attachments/technical-analysis/123398d1318274245-stan-weinsteins-stage-analysis-wpi_2-25-05.png I would have originally marked the Stage 2 breakout level as 30.60, which was made in September 2004 and then it broke above in December 2004. However, that was just the first breakout towards the first resistance and into Stage 1A and not the Stage 2 breakout. It then failed to reach the resistance level and pulled back to the 30 week WMA and was beginning to turn up again making it Stage 1 (from the Global trend Alert sample) and very close to Stage 1B by my reckoning. So now the first high above the 30 week WMA had been defined, that then gives a new breakout level to watch, which I believe would then be the Stage 2A breakout, so $33 in WPI's case. Also, I re-listened to the November 2011 interview with Stan tonight and he mentioned he likes to do a lot of late developed Stage 1 buying, and for trader picks will buy as early as 4B- sometimes. So whether we disagree on if it's a breakout into Stage 1 or Stage 2; for a trader, both are tradable levels, but the investor should wait for the higher longer term confirmation level above the resistance zone as you need to be aware of your opportunity costs. So for example with Copper when it broke the 3.75 level in January it was a tradable breakout into a broader Stage 1 base, but it was moving into a strong resistance zone between 3.80 and 4.00 and also was below it's 200 day MA. So it was a short term trading opportunity only still imo as it hadn't cleared that resistance zone and the risk reward was poor, so there were better opportunities elsewhere with less resistance at that point in time. Hi isa, you've been following this method for a while. I am just getting started. I am curious how well you've doing with this method in real life investing? Also, in the sample GTA newsletter, what is difference between "trading sell stop" and "investing stop"? Thanks. I did used to think the same as you when I first started this thread, but when I started going through the examples from the global trend alert last October I changed my view as the Stage 1A, Stage 1 and Stage 1B examples led me to believe I had been calling the Stage 2 breakout too soon, especially when there was a decent amount of overhead resistance to work through. Have a look through the examples again here: http://www.trade2win.com/boards/technical-analysis/134944-stan-weinsteins-stage-analysis-3.html#post1698054 and see if it changes your mind. . . . . So for example with Copper when it broke the 3.75 level in January it was a tradable breakout into a broader Stage 1 base, but it was moving into a strong resistance zone between 3.80 and 4.00 and also was below it's 200 day MA. So it was a short term trading opportunity only still imo as it hadn't cleared that resistance zone and the risk reward was poor, so there were better opportunities elsewhere with less resistance at that point in time. Thanks isa for that full explanation, I can see my mistake now. Three weeks ago, copper actually looked more like the KO Coca Cola example, where price falls, jigs about, puts in what looks like a low, moves out of the jigging, and the 30wk wma moves up, but is still marked as a 1a. Weinstein clearly likes an extended and patterned bottom formation, such as the KLAC 1B+ example, so I must re-read 96-103 and 118-129. Hi isa, you've been following this method for a while. I am just getting started. I am curious how well you've doing with this method in real life investing? Hi thuang68, thanks for joining in. I've been very pleased with my forward testing so far and have recently doubled my test account size so that I can add more picks to my portfolio as we move further into Stage 2. 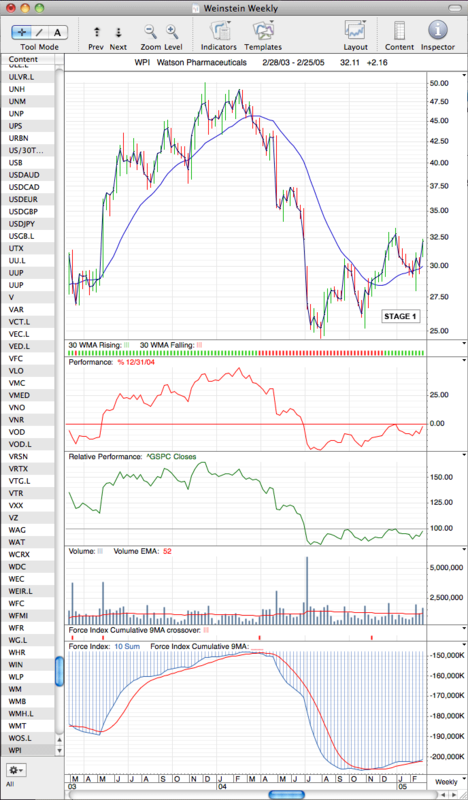 I've been keeping a journal on Big Mikes here: Trading breakouts with stage analysis - Trading Journals, so you can see how I'm doing in detail on there. It has some of the same stuff as this thread as I put the major charts on there as well, but it has other stuff such as market breadth charts and my portfolio updates as well as it's my journal. But for quick stats I'm currently up around 7% since my first Weinstein pick on 27th October 11 and from the 19 positions so far I have closed 7 positions for 5 wins and 2 loses. So I now have 12 open positions of which 11 are positive so far and 1 is negative at -2.14% currently. The book can tell you how to find good picks and when to sell them, but it doesn't tell you how to manage your portfolio. So I wouldn't judge the method on the percentage gain I've achieved as that's down to me alone. But I think the number of winning picks over losing picks shows how good it is. Also, in the sample GTA newsletter, what is difference between "trading sell stop" and "investing stop"? Thanks. Read Chapter 6: When to Sell - page 178 onwards as this goes into great detail of where to place your stops as an investor or as a trader. Basically though, for the short answer an investing stop is placed under the last major support zone on the weekly chart and under the 30 week moving average, whereas the trading sell stop is for short term traders following the trader method so is placed much closer under the most recent pivot level before the breakout. I'd recommend reading through Chapter 6 and doing the quiz at the end to make sure you understand what you've read. I think what I've taken from doing the examples the most is to really consider the amount of recent resistance that it has to work through. As for example if there's large resistance such as copper has at the $4 level, then a bigger Stage 1 could occur as it hits that resistance and sells back down. Whereas if the resistance is negligible, then there's much more chance of a very small Stage 1 that moves very quickly into Stage 2. So be mindful of the amount of resistance above when deciding.